In our house, we are very inspired people. Inspiration, as you know, shows itself in many forms. In our kitchen, for example, inspiration shows itself when we go grocery shopping and decide we are going to either try out 15 new recipes in a week or when we are going to eat completely healthy, so we overbuy on fruits and veggies. The second one wouldn’t be too bad, except things never work out that way and we always end up having veggies go bad before we get to eat them! It was with great hopes that I accepted the chance to try out BluApple. As many of you know, I am very skeptical. This hasn’t changed, so I went into this with my skepticism strong, as is normal. 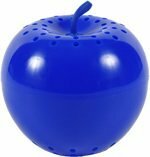 BluApple proclaims to keep fruits and vegetables fresher for longer periods of time. 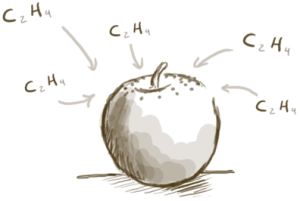 They are said to work by absorbing the gas that causes fruits and veggies to over ripen. Sounds too good to be true, huh? Our produce NOT ruining before we get to it???? Sure, that’s gonna work… I’m game for just about anything. With a 100% money back guarantee (and yes, I AM that person who WILL follow through with getting my money back) I really don’t think I could possibly go wrong for me. I tried it. 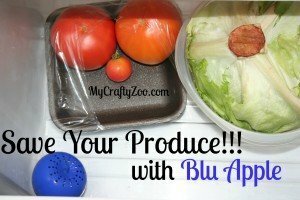 After about 3 weeks in my crisper, I see the awesomeness of the Blu Apple! Lettuce is my number one ruining veggie. I buy it, use some, then forget about the rest. I’m super excited to report that after having forgotten about my leftover lettuce for 9 days, it was STILL good! Saved me from that quick run to the store when I realized I did indeed have some AND it was still good. Plus, totally worth it! Lettuce, as you probably know, wilts super fast so having it stay fresh and not wilt was awesome! I’m sold. No getting my money back, on to buying refills! I could do a cost analysis of my savings for the veggies and fruits I’ve saved thus far, but that would do you no good, as you probably get a different amount of produce than I do. So, I’m just going to say: $9.95 for two blue apples. They are supposed to last 3 months before you need to refill them. Refills (which is usually where companies get ya) are $9.95 for a whole years worth! So, for $20 you will have a year and roughly 3 months where you don’t have to worry about your fruits and veggies ruining if you wait a few extra days to use them! I’d call that a win! we buy a lot of produce now that we are trying to eat healthier. I usually buy some 2-3 times a week just so it doesn’t go bad. This would be great if it let me just do one shopping trip a week. The gas money I would save would more than offset the cost.